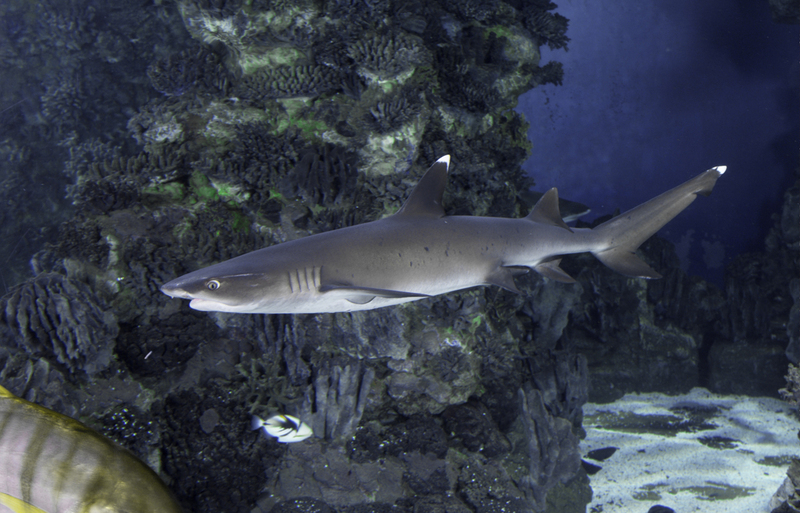 The whitetip reef shark has white tips on its fins. Its basic colour is light grey, lightening more and more on the sides until its belly, which is white. It has some dark stains on its body. It can live up to 25 years. Its maximum size is 2.13 m, though normally adults are under 1.6 m.
This shark hunts at night and is specialised in catching its prey from the holes and cracks in the coral reef. It feeds on fish from the sea bed, such as morays, surgeonfish, parrot fish, picassofish, and lobsters and octopus, which it locates by smell and hearing; it is therefore carnivorous. As it is a viparous shark, it gives birth to live offspring, 1 to 5 per uterus, after a gestation of some 5 months. The offspring are born with a size of 52 to 60 cm and reach sexual maturity when they reach a little over 1 metre. 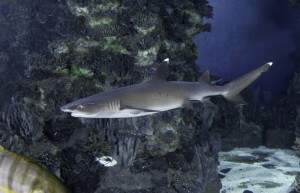 It is a sea bed shark that rests during the day in underwater caverns or on snadbanks, at a depth of 8 to 40 m, with other individuals of the same species. It lives on reefs and in tropical lagoons in seas such as the Indian-Pacific, the Red Sea and the coasts of Oceania. A species evaluated at of less concern, but close to being classified as vulnerable (according to the red list of endangered species). In captivity it takes a lot of interest in the aquarists that look after it and swim with it.